It’s that time of year again to decorate your home for the holidays and what better way to brighten a room than with poinsettias? Due to their popularity this time of year, poinsettias are the best-selling potted plants in the United States. Native to the warmer southwestern U.S. climates and Mexico, poinsettias are susceptible to cold and frost. So, when you bring them home in cold weather, make sure to bring them right home. Don’t leave them in your car and go back to your Christmas shopping. Originally from Mexico and Central America, they are the largest flowering plant crop in the U.S. with sales of over 63 million pots! Find the Ideal Spot. To keep them looking good, give poinsettias a sunny, south-facing windowsill or bright filtered light. Don’t press them close to a cold windowpane however, because this can damage the leaves. Keep them at about 68 degrees F during the day, and cooler at night, to prolong the display. Watering and Feeding. 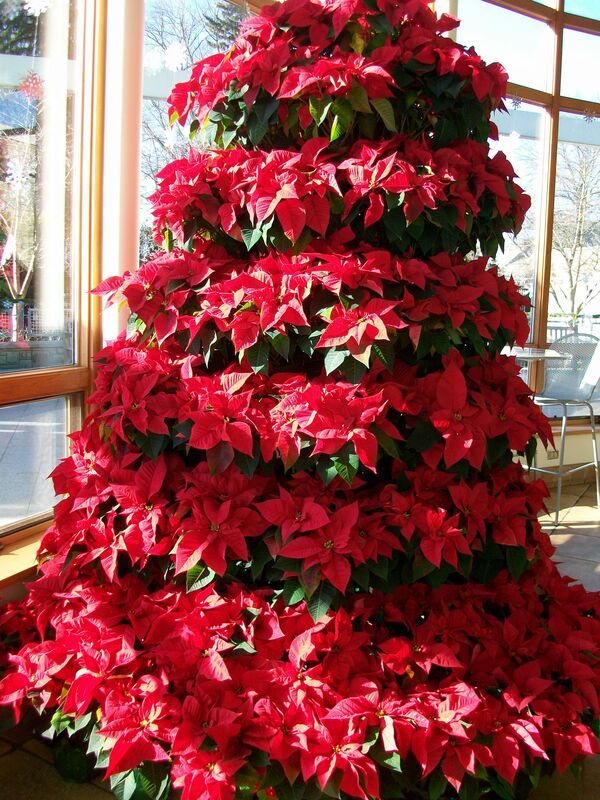 Poinsettias should be watered regularly and kept evenly moist. Never let plants sit in water; always empty their saucers or planters shortly after watering. Getting Poinsettias to Bloom Again. With proper poinsettia care after Christmas, you can get a plant to perform again. Water it until mid-spring, then let it dry out and allow the stems to shrivel. Keep it cool. At the end of spring, cut all growth to a couple of inches above the soil and repot it in new soil. Water well and keep it warm, feeding it with houseplant fertilizer when new growth appears. A month later, move the plant outside to a shady location, pinching out the growing tips in midsummer, before returning it indoors. Give it a sunny spot, watering and feeding regularly; then from mid-autumn, keep the plant in total darkness between 5 p.m. and 8 a.m. It will then re-flower and produce colorful bracts. Top Tip: Leaf Drop. It’s common for a few poinsettia leaves to turn yellow and drop off when you first bring them home. Don’t be alarmed — the plant is just reacting to its new living conditions. With some tender care your poinsettias can last you until next holiday season! This entry was posted in Entertaining and tagged entertaining by admin. Bookmark the permalink.